Project obstacles and solutions: SIA needed to expand its parking lot at its manufacturing facility in Lafayette, Indiana. They hired Specialties Company to stabilize the soil before it was repaved. This involves tilling lime or cement into the soil before its final grade, then compacting it to provide a strong subgrade for subsurface stone and asphalt pavement. Dry lime or cement applications can result in fugitive dust around the work site. In this case, Specialties used a cement-slurry mix for the binder. This eliminated airborne dust at the site. The SIA plant was active and within a few hundred feet of employee parking areas. The reduced dust was key to meeting Subaru's requirements for the project. 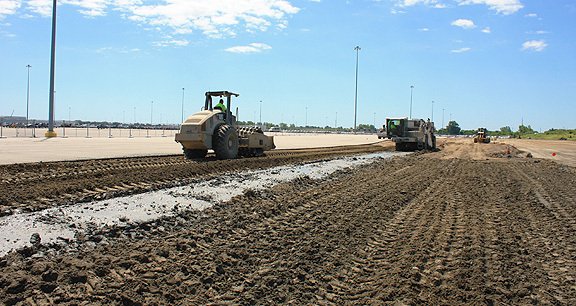 IMI provided 1,100 yards of slurry mix for the nearly 300,000 square foot of parking lot. At a rate of 60 lbs/square yard, the slurry mix provided an effective binder to stabilize the soil. For more information on Slurry Mix from IMI, click here. For more information on soil stabilization, click here.